Scot Borofsky, born in 1957, grew up Southern Vermont and made his first trip to Mexico at the age of eighteen, with three friends, traveling first in a Volkswagon bug to Texas and later, once in Mexico, by bus, and in the second class section of the then popular rural passenger trains. By the time the "Stepped Mountain" paintings were begun in 1987, the young artist had spent over ten seasons Wintering in Mexico, each year spending some months in a campground close to the Mayan ruins at Palenque. It was there that Borofsky went annually to escape the pressures of New York City, where he was developing his art career, to live more or less comfortably enough to explore his newest ideas in paint. The "Temple of the Inscriptions", (seen at left), was extremely familiar to Borofsky from many visits to the ruins site, including the "King's Tomb", inside, at the base of the pyramid, which he entered many times. Borofsky became very integrated with the various Mexican communities where he stayed, for months each Winter, including Palenque, where he became well known as an artist to locals. Borofsky likes to joke that he knows the woods near Palenque better than near his home in Vermont, but he in fact did explore the rainforest quit extensively, in the area of the Mayan Ruins of Palenque. On a few occaisions he has hiked to small villages deep in the jungle to visit and learn about existing Mayan culture. In the photograph above Scot is pictured in front of a corn "milpa" deep in the rainforest, near a self-sustaining traditional Mayan village, familiar to him, and reached by two days walk, through the jungle, on ancient Mayan foot paths. During the Winter of 1982, Borofsky began developing his personal language of "symbols", while camping in Palenque, in colored ink drawings on rice paper. Returning to the Lower East Side in Spring, he began the first of many outdoor spray-paint murals which relied heavily on ancient Mexican art and decoration, for inspiration. As shown in the photographs at left and below, the street artist Scot Borofsky, created symbols and horizontal patterns which were placed at key locations in the East Village and architecturally in relationship to each other. The mass of paintings was located in the vacant lots between East 5th Street and East Sixth, to the East and West of Avenue C, where about twenty paintings created an outdoor installation the size of an "Earth-Work", titled "The Pattern Walk." In 1985 Scot Borofsky had his first one-person exhibit of large Spray Paintings on Canvas in the East Village, at the newly opened, Mokotoff Gallery. Borofsky refined his spray technique in large paintings and began to create works on paper using Japanese influenced brushwork and pastels. Some small sculptures recalling earlier work, which had been African influenced masks and the collages of Kurt Scwitters, were also exhibited. These were masks, and abstract figures made from individual found objects which had been spraypainted. A series of small painted photographs from a fold-out picture book of the ruins of Pompeii exhibited at Mokotoff, gave the impression the the artist had "grafittied" many of the same designs from The Pattern Walk on the walls of Pompeii thirty years earlier. Borofsky's craftmanship in visual media has always been subservient to a "conceptual" approach to organization. Since first visiting Mexico and being intrigued by the ancient art, Borofsky has made an in depth study of ancient graphic rules of pattern-making and of the aesthetic stylistic development of sculpture in Pre-Columbian American cultures. This he has done by visiting many different ruins sites and by filling notebooks woth copies made in Mexican museums. One of the examples of sculpture the artist emulated are the huge Olmec heads found in Veracruz. In the painting, (at left), entitled "Sister Buddha", a portrait of Borofsky's one time partner, the dancer Mariko Higuchi, combines an Asian "Buddha Head" influence with inspiration from the Olmec Heads. The face of "Sister Buddha" also has the strongest characteristics of Borofsky's symbols, in that the features may also be read visually as a 'balancing' type figure, or perhaps an architectural "Stuppa", or Tibetan prayer icon. The lines have the fluidity of Asian calligraphy, while the simple three-color spray paint palette recalls the "fuzzy-edged" two or three color paintings of Abstract Expressionis Mark Rothko. While studying at Rhode Island School of design, where he received a degree in painting, and studied sculpture, Borofsky took a personal interest in the history of Asian art, taking courses in Ukiyo-e wood-block print: Ancient Chinese and Japanese landscape painting, and in Haiku. It was in this manner that the artist discovered the poetry of the Japanese father of Haiku, Basho. The story of Basho's wanderings over the Island of Japan, while composing Haiku to describe his experiences, coupled with the "album" prints by Hokusai illustrating the high and by-ways of Japan, or many views of Mt. Fuji, were strong suggestive influences in his conception of the "Stepped Mountain' travel series. Honoring the ancients; the subject of mountain and mist; the quiet of nature without human intrusian, all this came from the Japanese. Basho, the poetic "Johnny Appleseed" of Haiku lived in Japan from 1644 to 1694. A portrait of Basho appears at left, with a transperancy of his grave-stone. Amoung the wails of the wind. With thin films of morning mist. at the summit of a pass. The faint aroma of snow. By men of this world. Although historical information about his travels is scant, it is fairly reasonable to conclude that the Rennaiscance Master, Leonardo da Vinci made sketches in the Alps, while traveling there as a youth. It is quite possible that some of these sketches were used to supply the backgrounds for some of Leonardo's portraits and allegories of Saints. This concept, of the artist travelling to collect visual information, which in turn might be used to enhance artworks yet to be conceived, became central to Borofsky's own conception of the "Stepped Mountain" travelogue. In 1987-88 Borofsky exhibited some examples of a design of a breaking wave, first made after exiting foamy surf, directly after body-surfing in 12 ft. Pacific Ocean breakers, at Zipolite, in Oaxaca, Mexico. This "Wave" design is also comparable to some of Leonardo's sketches from a group of storms in the mountains, titled, "The Deluge". Both works use the inherent visual power created by simple spirals depicted in motion, representing forces of nature. In both Leonardo's "Deluge" (at left) and in Borofsky's "The Wave", (two examples shown below), the power of the simple form is hard to deny. The over-riding concept behind Scot Borofsky's style of artwork is the desire to create a visual language which transcends cultural boundries, an art accessable to all cultures and peoples world-wide. To achieve this concept, the artist has made a comparative study of the art of all cultures at the formulative early stages of visual expression. In doing this Borofsky came to the conclusion that 'spirals' and "stepped line" patterns, (created by the grid-like nature of all types of weaving), are present in almost all types of early art. Thus, in trying to access the possibility to tap the "genetic memory" of a viewer, the artist has employed these simple design ideas into most of his graphic "Symbols". The "Stepped Mountain" paintings incorporate the 'stepped line' as a constant, emulating: weaving designs; pre-Columbian pyramids; and the visual character of mountain ridges, featured with rocks or trees. The style of these paintings can actually be imagined by combining the character of the two paintings pictured below, at left. Both were made in 1987 and exhibited in 1988, at Mokotoff Gallery. The "Yin-Yang" composition of "Taoist Landscape" features 'fuzzy' spray-painted trees, on a mountain side. The Brown and yellow, "Christmas Mountain", features a stepped mountain form, more or less taken directly from a Mixtec serape. 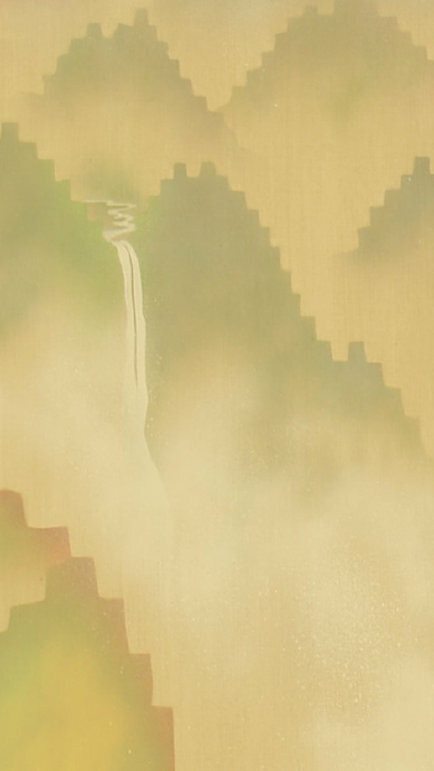 Visually, the effect of soft spray painted edges and mist, depicted in a landscape, are altogether similar. Borofsky, who discovered the Navajo-like character of contemporary Mixtec weaving while staying in Oaxaca City during the early eighties, has collected close to fifty of the completely traditional, backstrap-woven serapes, made by Mixtec women in the mountains to the West of Oaxaca City. He has visited the seven isolated Mixtec villages, in the area of San Miguel Peras,unknown home to perhaps the most traditional weaving in Mexico, on three different occaisions. "For the young artist, born into the world at one time and place, or another, the problem is the same. One must find one's voice and reflect, through it, that world. Everything in an artwork speaks of the moment of it's creation. And thus it speaks to us, in the language of art. But the voice it speaks through is the voice of the artist. And that too, in time, is recognizable. Every artist has a thirst, and each quenches it through the act of creation. Simply put, the artist believes above all, in art. Today, the artist has the whole of the world and it's history for inspiration. But instead of rising to the occaision, many hide in fear. It's said that the most beautiful music is only heard by musicians. The most beautiful experience for an artist, is witnessing art make itself,through your own hand and before your own eyes. Only the fearlessly curious will see it. Some, over and over. Inca Ruins in Peru, "Macchu Picchu", which the artist has hiked to twice. Besides the various influences which contributed to the conceptualization of the Stepped Mountain paintings: the artist's Winters at Palenque, Mexico; love for the mountains and mist of Asian landscape painting; esteem for the travels of Basho, Hokusai, Leonardo; and the bare need to experience and collect: besides these, references to other artists may also be found in the paintings. Another artist-traveler who sought some form of paradise, was of course, Gauguin, an early and long time influence on Borofsky as an artist. Borofsky gives homage to Gauguin's painting of the Tahitian Earth Goddess and God of the Sky, "The Source", painted in Tahiti, in an egg tempera-on-paper study of a waterfall, made by Borofsky in San Augustin, Columbia. 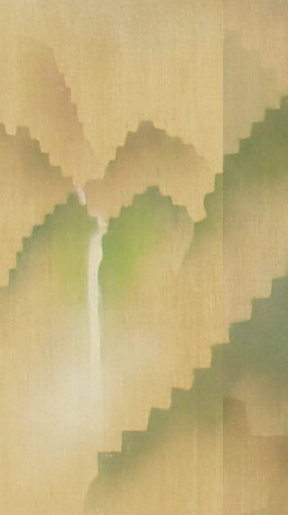 The same subject, and title, "The Source" was shared with the spray-painting, (at right), of a waterfall; and with a construction, (at below-right), also of a waterfall .